Every winter, like the North America tourists who flock to Cabo San Lucas to escape the cold, the Gray Whales also migrate to the region off the coast of the southern Baja Peninsula to court, breed, spawn and nurse in warm waters. Travelling thousands of miles from the Arctic, these massive cetaceans arrive off the coast of Los Cabos every January and stay through March. 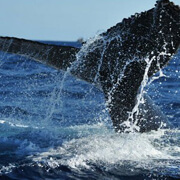 You will be astounded by the majesty of these enormous marine mammals as they emerge from the surface of the Sea of Cortez or the Pacific Ocean. The sheer size of these animals is enough to take your breath away. You may witness a tail slap, a breach, or a blowhole spray. Look closely and you may even see a newborn calf travelling under the protection of its mother. Mother Gray Whales tend to stick closer to shore, preferring to frequent the protected coves and bays for security. Gray Whales generally stay closer to the coastline compared to most whales. 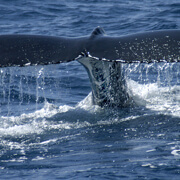 They also exhibit feeding habits believed to be unique amongst whales: they are bottom feeders. These massive animals scoop sediment off the sea floor in order to filter out tiny nutritious crustaceans from the soil. We offer a variety of vessels for your whale watching excursions, from large and luxurious multi-decked power cats, to sailboats, to Hawaiian-style catamarans, to small maneuverable zodiacs, to a replica pirate galleon. 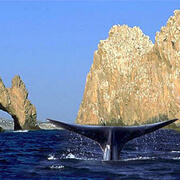 Take this fabulous tour from Cabo San Lucas Marina aboard the Pez Gato to see Gray Whales in their natural environment. Seasonally, from the beginning of the year through the end of March, Gray Whales migrate to the pleasant waters of the Sea of Cortez from the cold waters off Alaska. This shared sunset sailing charter on one of our classic 30-foot or 42-foot sailing vessels offers something for everyone to enjoy, including whale watching, snorkeling and sailing into the Pacific sunset. 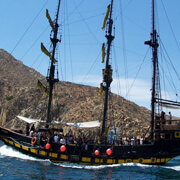 Join our friendly English-fluent crew for an exhilarating adventure on the Sea of Cortez and the Pacific Ocean. Our fully customized whale watching vessels and our first-rate bilingual guides have made our tours the most popular whale watching excursions in Cabo San Lucas. 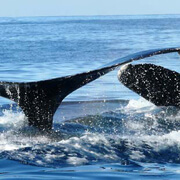 Our whale watching crafts are designed for both speed and minimal disturbance of these amazing cetaceans. Depart with the crew of the Cabo Escape from the marina in downtown Cabo San Lucas for an exhilarating excursion to view the impressive Gray Whales as they maneuver through the waters of the Sea of Cortez. It is truly a wonderful experience to witness the magnificent Gray Whales in their natural environment of the amazing waters of the Sea of Cortez. 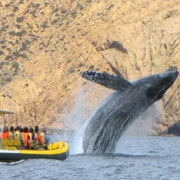 If you are visiting the vacation wonderland of Cabo San Lucas, do not miss your chance to go whale watching with the friendly and accommodating crew of the Caborey. Venture from the Cabo Marina for an exciting expedition to see the extraordinary Gray Whales as they swim through waters off the coast of Los Cabos. 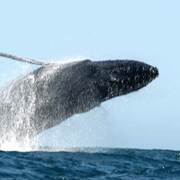 Annually, these gargantuan mammals migrate from the cold northern waters of the Bering Sea to enjoy the warm food-rich waters of the Sea of Cortez. Every winter, a large population of Gray Whales participates in a mass migration from the frigid waters off the coast of Alaska in the northern Pacific Ocean and the Bering Sea to the warm waters of the Mexican Pacific coast and the Sea of Cortez. You and your party will be amazed as these gargantuan cetaceans breach the surface of the water in a dramatic show of their awesome power. Climb to thrilling heights and traverse our breathtaking Zipline course at Costa Azul (the Blue Coast). 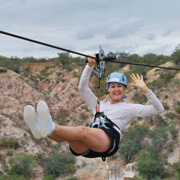 You will soar over this ten cable zipline course at speeds approaching thirty miles an hour. You will be flying way above the rocky arroyos and canyons near the Sea of Cortez.